The following are questions and answers to frequently asked questions regarding a rare astronomical event known as the Transit of Venus. In recent times, this rare event occurred the early morning of 2004 June 8 and will occur again the early evening of 2012 June 5. Click here to learn more about a safe public viewing event, for 2012 Transit of Venus, at the Mount Lebanon Public Library, located in the South Hills of Pittsburgh. What is a "Transit of Venus"? Can a Transit of Venus occur at night? How rare is a Transit of Venus? Why is a Transit of Venus so rare? How long is a Transit of Venus? Why can we not see the entire Transit of Venus event in 2012? Why is it dangerous to look at the Transit of Venus without the proper training and proper equipment? In Astronomy, a "transit" has three primary definitions. All refer to the movement of a celestial object through space in relation to another object. In the case of the transit of a planet, such as Venus, this refers to Venus moving directly in front of the Sun and across the image of the Sun's surface (from our perspective on Earth), as viewed with a telescope (using safe viewing techniques only). In the case of the Transit of Venus, the planet Venus transits the Sun. In the photograph below, you can see the planet Venus as it is close to the end of the planet's transit of the Sun in 2004. This photograph was taken during the only public Transit of Venus observing event in the City of Pittsburgh on 2004 June 8, co-sponsored by Friends of the Zeiss and The Duquesne Incline. Yes, a Transit of Venus can occur at night, but anyone living in a section of the Earth experiencing night could not see it. A Transit of Venus occurs when Venus travels directly in front of the Sun (as viewed from Earth). Hence, both the Sun and Venus have to be in the sky, for people to see it with a telescope (using safe viewing techniques only). In 2012, people will not be able to see the Transit of Venus, by way of a telescope, due to nightfall, in the following areas: Antarctica, Portugal, half of Spain, most of South America, and a third of Africa. Fortunately today, people living in these areas will still be able to view the Transit of Venus via a web-cast on the Internet. Transits of the Planet Venus come in pairs, each eight years apart. For the current pair in the 21st century, the dates of occurrence are 2004 June 8 and 2012 June 5. Each pair of Transits of Venus occurs in a pattern that repeats every 243 years. Hence, a pair of transits occur in one century, skip 121.5 years until the next pair occurs, then skips another 105.5 years for the following pair to occur; then this pattern repeats. This is why no Transit of Venus occurred in the 20th century. Also, we are fortunate that, for the current pairing of the Transits of Venus (i.e. 2004 and 2012), we can observe this wonder of nature in mild June weather. For the last pair of transits (i.e. 1874 and 1882) and for the next pair of transits (i.e. 2117 and 2125) observers had to, or will have to, contend with December weather! At certain times during the year, Venus passes between the Sun and the Earth. This is known as inferior conjuntion. Although the Sun is huge, Earth is millions of miles away from the Sun (on average, a distance of 93 million miles, known to astronomers as one Astronomical Unit). So, the Sun does not appear large in the sky. Hence, most of the time when Venus passes between the Sun and the Earth, it passes above or below the Sun, from our perspective. As a Solar Eclipse only occurs when the Moon passes directly between the Sun and the Earth (and, this occurs infrequently) a Transit of Venus occurs only when Venus passes directly between the Sun and the Earth (and because Venus is much farther away than the Moon, this event occurs much less frequently). The time length of a Transit of Venus varies, depending on what portion of the Sun is transited and how much of the Sun is transited. 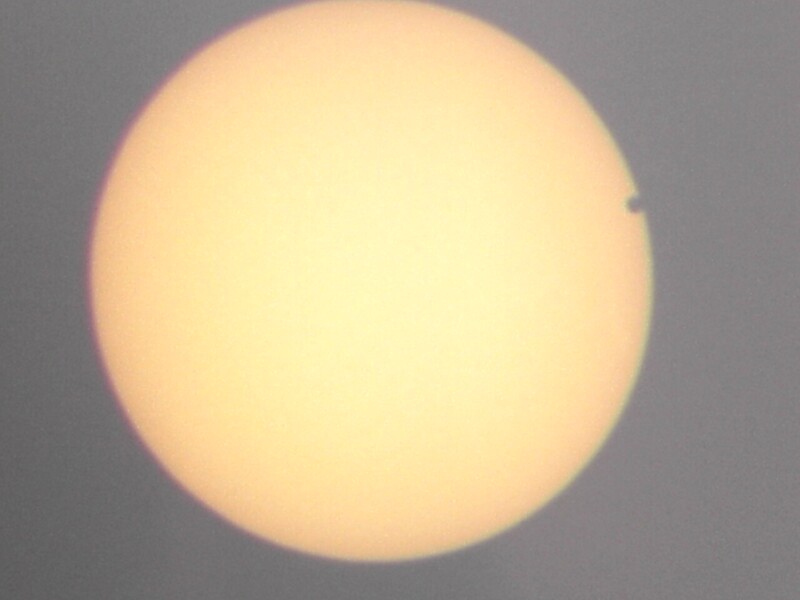 The entire length of the transit event in 2012 will be a little less than seven hours (six hours and forty minutes). Actually, some people will be able to see the entire event with a telescope (using safe viewing techniques only). However, they have to be living in Alaska, far northern Canada, half of Asia, or half of Australia to be able to see the entire six-hour and forty-minute event. People living in Antarctica, Portugal, half of Spain, most of South America, and a third of Africa will not be able to see the event at all, by telescope; fortunately today, these people will be able to watch the event on a web-cast on the Internet. However, people in the rest of the world (including North America) will be able to see a portion of the event with a telescope (using safe viewing techniques only). Looking at the Sun, anytime, is dangerous. Anytime you use your unaided eye to look directly at the Sun or a Solar Eclipse (also known as an Eclipse of the Sun), unless you take proper viewing precautions, this could cause MAJOR EYE DAMAGE and POSSIBLE BLINDNESS !. Eye damage can occur rapidly, without any pain, since there are no nerves in the eyes. Click here to learn a safe way to view a Solar Eclipse or Eclipse of the Sun. A Transit of Venus cannot be seen with the unaided eye. Since some type of optical magnification device is necessary to view a Transit of Venus, this makes it much more dangerous. Any time a telescope, binoculars, or any other type of optical device is used to view the Sun, it could result in PERMANENT BLINDNESS INSTANTLY ! In fact, if you place a piece of wood near a telescope eyepiece, while that telescope is aimed at the Sun, the piece of wood usually starts burning right away! It is very important for anyone, wanting to view a Solar Transit of a Planet or a Solar Eclipse/Eclipse of the Sun with a telescope, binoculars, or any other optical device, to receive the special training and acquire the special equipment required to do so safely! Without such special training and special equipment, it is best to look for public observing events where experts will show a Solar Transit of a Planet or a Solar Eclipse/Eclipse of the Sun to the public, using safe telescope techniques. Such public observing events can often be found by inquiring at a local planetarium, astronomical observatory, science center or museum, the Astronomy or Physics Department at a local college or university, amateur astronomers' club, or local library. Sometimes, one or more of these organizations will sponsor an observing session utilizing professional equipment operated by trained astronomers. If you are in a sparsely populated area, or no group in your area sponsors such a public observing event for a special astronomical occurrence, you can sometimes find one or more web-casts on the Internet of the special astronomical event. © Copyright 2012, Glenn A. Walsh, All Rights Reserved. Contact Web Site Administrator: < faq-venustransit@planetarium.cc >. This Internet World Wide Web page created on 2012 May 29. Last modified : Tuesday, 29-May-2012 22:32:10 EDT. You are visitor number , to this web page, since 2012 May 29.